T-cells are part of the body’s immune system that is responsible for identifying, attacking and destroying diseased cells. However, cancer cells can hide. And in order for T-cells to get rid of cancer, they first have to “see” the cancer. Dr. Cooper and his team of researchers found a way to modify the T-cells collected from a leukemia or lymphoma patient and enable them to “see” the tumor cells. The research team employed a genetic engineering technique that makes the T-cells carry a “cellular antenna” (chimeric antigen receptor or CAR), which specifically detects a molecule called CD19 that is found on the tumor cell surface of several types of leukemia and lymphoma (including Acute Lymphoblastic Leukemia, Chronic Lymphocytic Leukemia and Lymphomas of the B-lineage). When the CAR-T cells are fully-equipped and infused back to the same patient, they can mount full-blown immune attacks on tumor cells. In addition, since cancerous tissues often contain less oxygenated cells, Dr. Cooper is developing an approach to make the engineered CAR-T cells seek out cancer cells specifically in tissues that are less oxygenated. Preliminary laboratory results are very encouraging. Moving research to patient care, Dr. Cooper’s team recently published their laboratory results from a high throughput device that rapidly makes large numbers of CAR-T cells. Although it is still early in its development, Dr. Cooper predicts the innovative device will provide a faster and safer method for redirecting immune cells. Early in 2015, a new company, ZIOPHARM Oncology, was launched to translate Dr. Cooper’s adoptive immunotherapy approach into new treatments for patients in clinics across the U.S.
Laurence J.N. Cooper, M.D, Ph.D., is a visiting scientist at the University of Texas M.D. Anderson Cancer Center and CEO of ZIOPHARM Oncology. He graduated from Kenyon College in 1986 and received his M.D. and Ph.D. from Case Western Reserve University. He then completed his medical residency at the University of Washington Children’s Hospital and Regional Medical Center. Dr. Cooper finished his schooling with a fellowship at Fred Hutchinson Cancer Research Center. Dr. Cooper joined the University of Texas MD Anderson Cancer Center in 2006, where his appointments included Tenured Professor in pediatrics and immunology, Section Chief of cell therapy at the Children’s Cancer Hospital and Associate Director at the Center for Cancer Immunology Research. 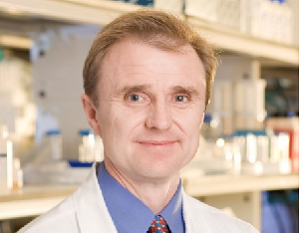 Dr. Cooper has received numerous awards and honors, including the 1994 Henry F. Sanders’ Award in Pediatrics from Case Western Reserve University, the 1999 Young Investigator Award from the American Society of Clinical Oncology, the 2004 American Society of Gene Therapy Young Investigator Award, the 2010 Best Boss Award at MD Anderson Cancer Center and the 2012 Robert M. Chamberlain Distinguished Mentor Award from MD Anderson Cancer Center. He has also authored more than 140 journal articles, book chapters and abstracts, and is a member of many societies and organizations, including the American Society for Blood and Marrow Transplantation, the American Society of Gene and Cell Therapy, the American Society of Hematology, the California Medical Association, the Center for International Blood and Marrow Transplant, the Harris County Medical Society, the International Society for Biological Therapy of Cancer, the International Society for Cellular Therapy, the Lymphoma Research Foundation, the Follicular Lymphoma Consortium, the National Cancer Institute’s Pediatric Oncology Branch and the American Society for Clinical Investigation. Your ticket for the: Laurence J.N. Cooper, M.D., Ph.D.